The first of the millennials are now in their thirties. Dubbed ‘the Peter Pan generation’, they have been accused of delaying adult milestones. But do marriage, careers, mortgages, and babies mean the same thing today that they did 30 years ago? Briohny Doyle turned 30 without a clear idea of what her adult life should look like. A greengrocer with a graduate degree, the world she lived in didn’t match the one her parents described. Her dad advised her to find a nice secure job; her best friend got married and moved to the suburbs. But she couldn’t help wondering if the so-called adult milestones distract us from other measures of maturity. In a crackling mix of memoir and cultural critique, Doyle explores how societies cultivate ideas about education, work, relationships, and ageing. She interrogates the concept of adulthood through the neon buzz of pop culture and the lives of other young adults. In a rapidly-changing world, she asks: what is an adult, and how do you become one? Briohny Doyle is a thirty-something millennial. The only daughter of a pair of middle-class, educated baby boomers, Doyle has a PhD but works as a greengrocer; she has a long-term partner, but they live in separate sharehouses. The questions about adulthood that plagued her in the lead-up to, and in the aftermath of, her thirtieth birthday form the foundation of Adult Fantasy. 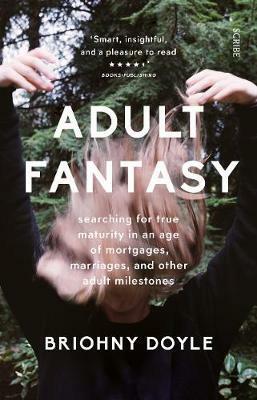 A Frankenstein-like investigation that incorporates memoir, ethnography, sociology and feminism, Adult Fantasy is an engrossing and enlightening read. The book is organised around the perceived milestones of adulthood: education, marriage, babies, work, home ownership, and retirement, examining why we’re getting further away from attaining these milestones, and whether or not they’re even relevant in the twenty-first century. The research is meticulous and fascinating, arguing that ‘intergenerational sledging’ is really a scapegoat for the true social and political forces that are responsible for today’s twenty- and thirty-somethings’ bewildered trudge towards adulthood. I loved this book. I found myself underlining so much of it that I thought I may as well give up annotating, lest I render it unreadable; often I found myself reading it on the tram and nodding vigorously in agreement. While this is partly because Doyle and I have a lot in common, including gender, age, and politics – not to mention mutual existential crises about university education and work, renting and ageing – Adult Fantasy, framed around Doyle’s own life and the great characters in it, is an absorbing mix of memoir and social critique for anyone curious about millennial ennui. I want to give this book to everyone I know, from my parents to high-schoolers, because it illustrates and explains just what it’s like to be a young person in Australia today.